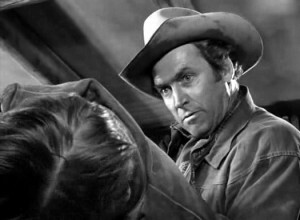 This movie marks the first cinematic pairing of director Anthony Mann with actor James Stewart, who teamed for five memorable westerns in the 1950s before falling out over Night Passage. As a notable actor-director pair in westerns, they rank with the John Ford-John Wayne and Budd Boetticher-Randolph Scott teams. For Stewart, it was his first western since 1939’s Destry Rides Again, and it marks the real beginning of his career as a significant western star. 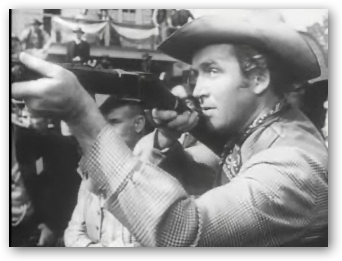 MacAdam (James Stewart) at the shooting contest. MacAdam is tracking down Dutch Henry for reasons of his own. Dutch Henry steals the rifle (among other things) and leaves Dodge abruptly. The rifle is coveted by everybody who sees it and seems to take on a life of its own, interweaving its own story with MacAdam’s chase of Dutch Henry. MacAdam and High Spade also cross paths with Steve Miller (Charles Drake) and his girl Lola Manners (Shelley Winters), and a cavalry troop besieged by Indians. The rifle goes from Dutch Henry to Joe Lamont (John McIntire), who trades guns to the Indians, including, unwillingly, this rifle. After the cavalry battle the rifle goes to Steve, although he doesn’t seem to deserve it. Near-psychotic gunman-outlaw Waco Johnny Dean (Dan Duryea, in a bravura performance) takes it—and Lola—from Steve and heads for Tascosa, Texas, where he is to meet Dutch Henry for a bank robbery. There he loses the rifle to Dutch Henry. Losing it with Waco Johnny Dean. As Dean and Lola wait in a saloon in Tascosa for a signal from Dutch Henry, MacAdam and High Spade catch up and recognize Lola from their previous encounter. MacAdam (showing some incidental instability himself) takes care of Dean, breaks up the robbery and sets out in hot pursuit of Dutch Henry again. He catches him, and they have it out in a final shootout in the rocks. (The shootout in the rocks has some similarities with the final showdown in The Naked Spur.) In the end, Lola (who has been wounded while trying to save a child) and MacAdam appear to end up together. The cast is remarkable, and not just the leads. Stewart is terrific, demonstrating his usual decency but with a touch of dangerousness, obsession and a little instability. The young Shelley Winters gives one of the best performances of her career as Lola, a blowzier Claire Trevor-esque role. Millard Mitchell is fine as High Spade; he shows up as a sheriff in The Gunfighter released the same year and later with Mann and Stewart again as a prospector in the small cast of The Naked Spur. Duryea as Waco Johnny Dean outshines Stephen McNally as Dutch Henry Brown when it comes to villains. 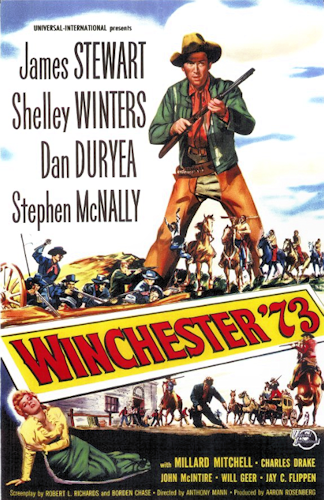 If you look at the supporting cast, you’ll find Will Geer as Wyatt Earp (although older and in a more senior position than he would have been in 1876) in the opening sequences; Jay C. Flippen as hard-bitten cavalry Sergeant Wilkes, in over his head in defending against a large force of hostile Indians; John McIntire as a sleazy gun-runner; Ray Teal; and Charles Drake as Lola’s unheroic fiancé Steve. Among the young Hollywood newcomers are Rock Hudson as the Indian chief Young Bull and Tony Curtis as the cavalryman who finds the rifle after the battle and gives it to Sgt. Wilkes. Fritz Lang was originally slated to direct this one, and when he pulled out Stewart recommended Anthony Mann, with whom he had done some stage work in the 1930s. It gave Mann his opportunity to move up from low-budget movies into A westerns, and he made the most of it. 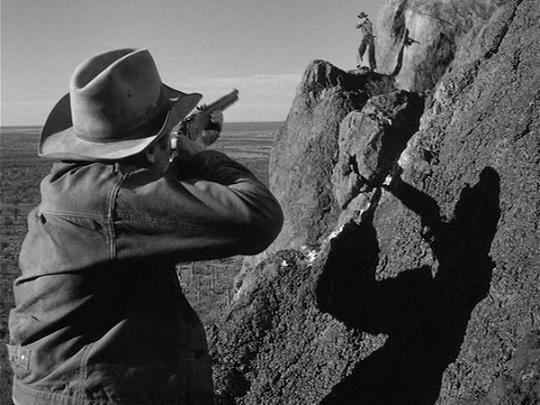 Much of Mann’s previous work had been in the noir genre, and it shows with the psychological elements of this and future Mann westerns—a new kind of mental claustrophobia in the wide-open spaces of the west. The film also gave a new twist to Stewart’s traditional persona; this one is decent, too, but also obsessed with vengeance and troubled by his own personal demons. These characters led to perhaps the most productive decade of his career, in such films as The Naked Spur (also with Mann) and Vertigo (with Alfred Hitchcock). Elegantly filmed in Arizona in black and white. 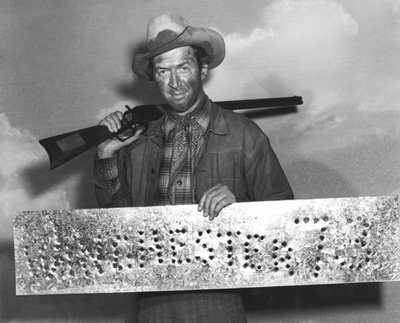 Production still of James Stewart. The DVD issued in 2003 has an unusual, fascinating and rambling commentary by James Stewart, originally recorded in 1989 for the laser disc version of the film. One wishes that John Wayne and Henry Fonda, or John Ford and Anthony Mann, had done a few such commentaries. You can see the rifle from the movie, with the names of the actors engraved on the stock (“Jimmie Stewart”), at the Cody Historical Center in Wyoming. This film made movie history in another way, too. Stewart’s salary was a bit steep for this movie’s budget, so he agreed to lower it and accept a percentage of the film’s gross as part of his compensation. When the film was a hit, Stewart did significantly better financially than he would have in just taking his usual salary. Instead of the $200,000 Stewart was requesting for the movie, he is said to have ended up with $600,000 because of the new deal structure. This led to many more such arrangements for stars in movie financing, as well as to much creative accounting about what the “gross” or “net” take of a movie might be. This entry was posted in 55 Greatest Westerns and tagged Anthony Mann, James Stewart, Manhunts, Psychological Westerns, Selling Guns to the Indians, Westerns Noir on September 24, 2013 by Nicholas Chennault.